Less than a week after retaining his WBA world heavyweight title against challenger John Ruiz, boxer David Haye is already hard at work training for his next match. David Haye (R) on his way to another win. The 29-year-old Englishman has had a meteoric rise to the top having been in the heavyweight division for just a little more than a year. 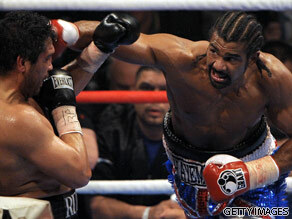 Haye has a staggering boxing record of 24 wins and only one loss - 22 of those wins have been by knockout. Prior to competing in the heavyweight category, Haye was the undisputed champion in the cruiserweight division. He also just released his brand new magazine – appropriately titled "The Hayemaker"
Known for his pinpoint accuracy and efficiency, Haye is taking your questions as our Connector of the Day. Do you want to get some boxing advice? Maybe you want to know what his training regime is like? Who has been his toughest competitor? Where does he see himself five years from now? Please leave your comments below and be sure to include where you're writing from. – What is your opinion on the way David William Donald Cameron, the current Prime Minister of the United Kingdom, is Improving the Boxing World? – What is your opinion on the way David William Donald Cameron, the current Prime Minister of the United Kingdom, is Improving the Health, Safety and Well-being of ALL Boxers? – What is your opinion on Heroin, Cocaine, Marihuana(Cannabis) and Prescription Drugs(medication) Addiction in the Boxing World? I am awaiting David Deron Haye’s replies. Dear David, why did you keep complaining how the Klitschko brothers were only boxing old, over-the-hill nobodies that are past their best years and then you yourself ended up fighting a 38 year old Monte Barrett, a 36 year old Nicolai Valuev (in one of the worst and most boring fights in boxing history), a 38 year old over-the-hill version of John Ruiz and now are rumored to fight a 38 year old journeyman Audley Harrison. Is it not time to take some of your own medicine and finally take some risky fights at heavyweight? Now that you've turned down a more than fair 50/50 offer to fight the true heavyweight champion, Wladimir Klitschko, who has stated he would even be willing to fight you in the UK; what would it take to get you in the ring with him? Either you or your manager had previously stated that 50/50 was what you wanted, but clearly this wasn't enough, so what's it going to be? Are you just waiting around waiting for the brothers to get old or that someone else less daunting somehow beats one of them and then maybe you'll make the fight? You have a very loyal British following who will support you no matter what, even in possibly taking a fight with the likes of Audley Harrison. However, I have to ask these questions because, quite frankly, in the U.S., you've become a bit of a laughing stock in the boxing community. Why won't you accept 50-50 from the Klitschkos, everyone is saying that you are scared? Why is it you talked such a big game to both the Klitschko brothers, even going as far as printing a T-shirt with both of them beheaded anu holding they're heads, but you refuse to get into the ring with them?? Even though both of them have made opportunities for you to fight them?? 50-50 split of the purse as well. I believe your heavyweight stint is a total sham and you should be ashamed of yourself for taking advantage of boxing fans by running yourt mouth constantly begging for a match with them when you know deep down inside you do not want to face them. A prime example would be just recently Wlad called you out on you tube and cleared is schedule to face you and you go silent, but now that that he is facing Samuel Peter your back running your mouth. Do us all a favor David Haye and either go back to cruiserweight or retie. Your not wanted in ther Heavyweight division. When will you fight a Klitschko? None of the politics, when? If you ever give Audley Harrison a title shot, it will be an embarrassment to the sport. Plain and simple. Also when will you quit running your mouth and fight a Klitscho. From what i read Wlad made you a fair offer and you bailed. Put up or shut up. Do you plan to branch out into other sporting arenas such as UFC? i will like to know when is gonna happen!!! I DO KNOW ITS NOT JUST THAT EASY. BUT CONSIDER FIGHTING A KLITSCHKO CONSIDERABLY VITALI..ITS GOING TO BE THE LAST ICING ON YOUR CKAE..